Welcome to the Community ToolKit! Poudre School District is committed to helping students succeed not only at school, but personally and in the community as well. To address the overall physical and emotional well-being of students, we've created a PSD Community Toolkit about issues affecting students and families today. This segment focuses on PSD mental health services for all students and how the district responds to students in immediate crisis, listing warning signs, parent tips and available community resources. 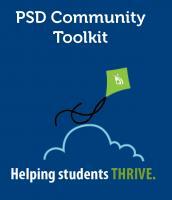 Visit the PSD Community Toolkit "Helping Students Thrive" home page for other important topics addressed in this series. Mental health services are available to all students to help them deal with emotional and crisis issues. PSD's Mental Health team combines school and community resources and programs to provide students with interventions, prevention and treatment, focusing on individual needs and reducing barriers to services. You can learn more about how the team works with students and families by visiting the PSD Mental Health Services web page. Students in immediate crisis: The team provides intervention as early as possible to help students who may have suicidal thoughts or are experiencing another crisis that involves harming themselves. If a mental health specialist is contacted about a student immediately in crisis that involves their safety, parents are contacted immediately and included while a plan and team of support are organized for the student. Learn more about the district's suicide prevention services, resources and training by visiting the PSD Suicide Prevention web page. Seek help or resources if you have questions or if you feel your child or family needs support from outside services. Attend a suicide prevention training to learn how to identify and help someone at risk for suicide. Acknowledge that you are taking them seriously. Let them know that you are accessing resources to help keep them safe. Assure them that you will be with them through the process. These links are provided as a service. PSD does not endorse or recommend services. Healthinfosource.com - Lists available resources and providers in the community, along with insurance information. Alliance for Suicide Prevention of Larimer County - Offers information about suicide, including facts, warning signs, community resources, grief support groups and more. Children Adolescent Young Adult Connection (CAYAC) - A program through Connections-Health District of Northern Larimer County. Call 970-221-3308; Monday-Friday, 8 a.m. to 5 p.m.; 1302 S. Shields St., A1-3, Fort Collins. Bullying prevention programs help create a positive school learning environment. Learn about them here.